Get a Volusion store design and a custom Facebook banner! Since 2007, Wholesale Vending Products has been bringing the best prices on everything that has to do with vending including machines, candy supplies and even cash management tools. 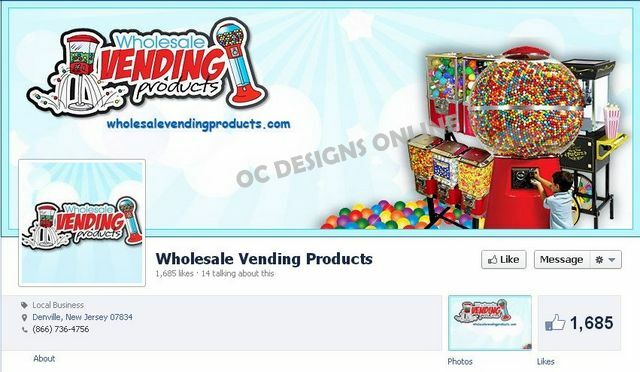 Located in Denville New Jersey, this vending ecommerce retailer asked OC Designs Online to help them by creating a great Volusion store design and upload an enticing custom designed cover banner for their Facebook page. Volusion stores offer tons of tools for all ecommerce retailers and each store we design comes alive and focuses on the company at hand. That’s just what we did for Wholesale Vending Products and if you’re interested in Volusion store designs, we can help you too! Great Store, Matching Facebook Banner! First, our designers gladly tackled their Volusion storefront—the top of the Volusion platform offers links to shopping carts, order status and even a wish list. To the left in front of a colorful blue background we inserted their toll-free telephone number and website address and in the center the company’s unique logo that uses fun vending imagery. Next comes a contrasting red navigation bar where shoppers can learn more about this vending product retailer, manage their shopping cart and account, contact the seller, get help from the seller and learn about their terms of service. The inviting and colorful welcome box comes next and immediately shows the seller they offer a “110 percent satisfaction guarantee” on prices, more crisp and clear vending images and text allowing shoppers know Wholesale Vending Products is their one-stop shop for all vending needs. Under the welcome box are best seller categories—these were important to list right on the storefront because shoppers needing vending supplies or equipment can find them easily. Again, each box focuses on colorful images with clickable boxes for easy shopping convenience. The left navigation sidebar offers a vending supplies menu with sub-heading for everything from antique gumball machines to candy to nostalgia electric popcorn and chocolate fountain machines to vending tattoos and stickers—and everything in between! The sidebar also allows shoppers to immediately follow this retailer on Facebook and Twitter! The store is rounded out nicely with the types of payments Wholesale Vending Products accepts along with must-have trust badges of associations and achievements. Also located in this Volusion store design are important why buys such as how they offer a large selection of products, fast shipping, secure shopping and the best customer service. We also included a place where shoppers can sign up for a free newsletter and read some customer testimonials, which helps to build an ecommerce retailer’s brand. A bottom logo, social media buttons, a mini store sitemap and how to contact Wholesale Vending Products are also prominently displayed at the bottom of this Volusion store design. For the matching Facebook page banner, we knew it was important it stand out and not just compliment the Volusion store design but include the same elements. That’s just what we did with their logo, website address and imagery! 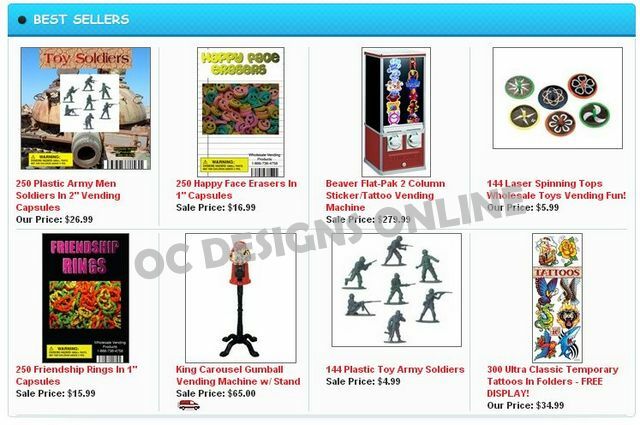 At OC Designs Online, we know every online retailer can be successful with unique store designs. Many of our clients take advantage of store combo designs such as this one where not only was the Volusion store design created but also a matching Facebook banner. We also offer combo store solutions like matching Volusion and eBay store designs or eBay stores with matching listing templates. Let us show you how we can turn your ecommerce store around and get noticed and stand out above your competitors just like we did for Wholesale Vending Products!